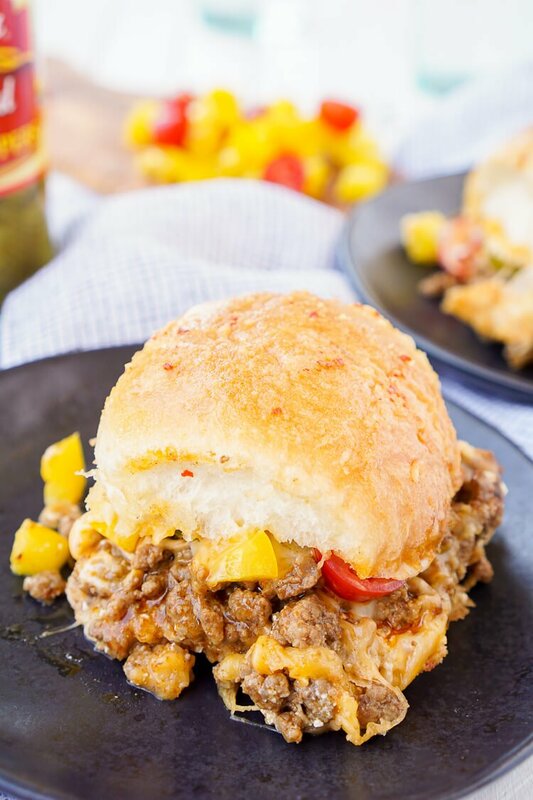 These Easy Taco Sliders are a great alternative to traditional tacos! They’re simple to make and loaded with flavor, a sure crowd pleaser and a great use for leftover taco meat too! What makes a taco better? 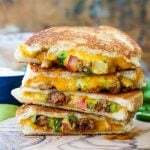 Taking the fixings, sandwiching them between bread and baking them. That my friends is pure taco heaven! 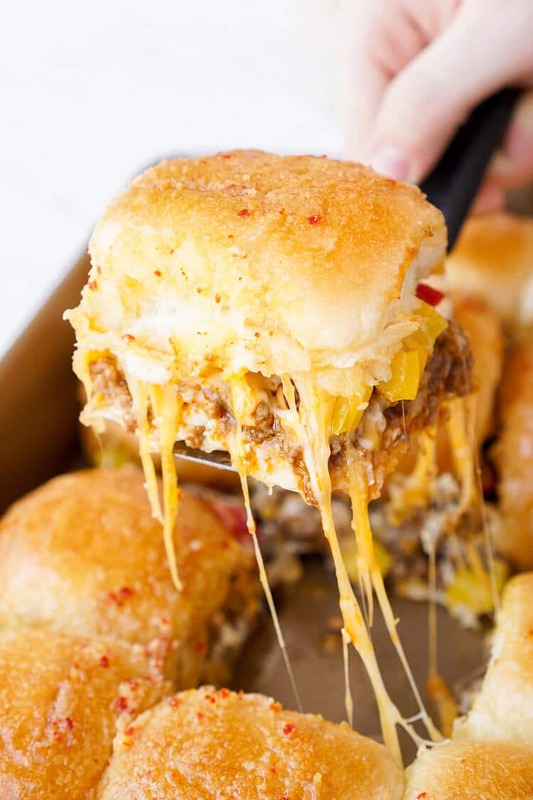 When you pull the finished sliders apart and see all that melty cheese, you’ll know exactly what I’m talking about! This recipe is fun and comforting and perfect for summer get-togethers, game days, or even just a quick weeknight meal. The whole family will be begging for seconds! Now, I don’t know about you guys, but I always enjoy a little heat on my tacos. Live dangerously, am I right? And since I have this terribly painful habit of rubbing my eyes after cutting jalapeños, I try to sub out fresh pepper for jarred pepper when I can and when it works for the recipe. I just can’t say no to fewer tears and more flavor! 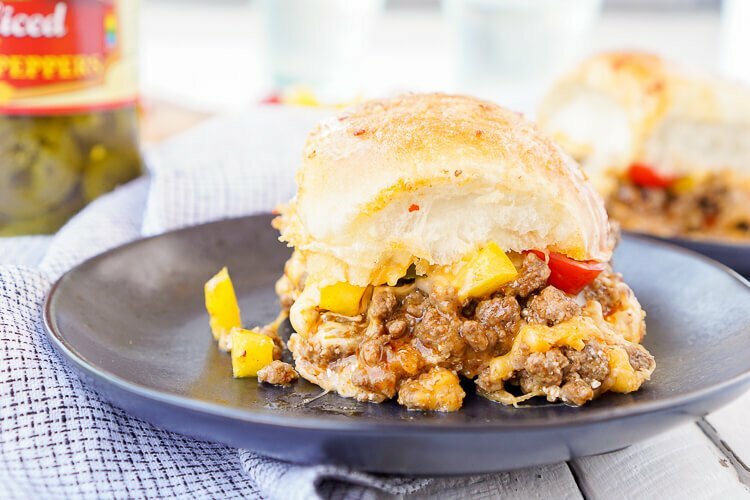 These Easy Taco Sliders are super tasty and with a little prep work ahead of time, you can have these babies reading in about 30 minutes! 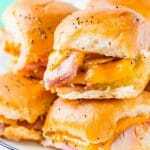 Want to see just how easy these sliders are to make for your next event or weeknight dinner? Check out the video below! 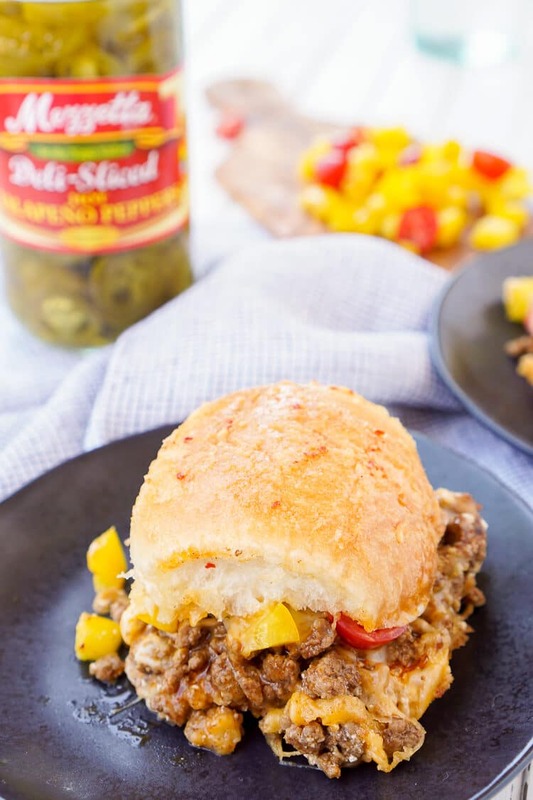 I love the way the butter allows the bottoms of these Easy Taco Sliders to crisp up, so it supports all the goodness on top of it, while the top half of the rolls stay soft. 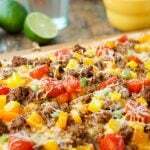 You can make your taco meat however you usually would and can add any extra toppings you want to the mix! With tacos, the possibilities are endless! 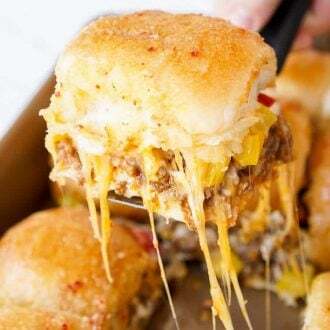 Pin this Taco Sliders Recipe for Later! These Easy Taco Sliders are a great alternative to traditional tacos! They're simple to make and loaded with flavor, a sure crowd-pleaser and a great use for leftover taco meat too! Spray 9 x 13-inch pan with cooking spray. Slice rolls like you would a burger bun and place bottom half in the pan and set the top half aside. 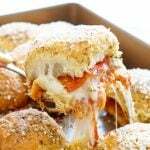 Spread sour cream over the bottoms of the rolls, evenly spread prepared taco meat out on the sour cream. Sprinkle the taco meat with 1 cup of the shredded cheese. 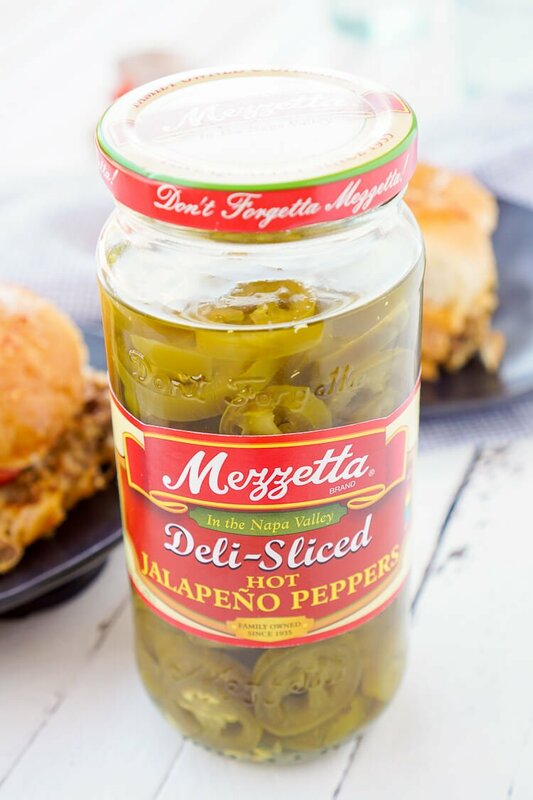 Evenly distribute peppers and tomatoes on the cheese and cover with the remaining cup of cheese. Place roll tops back on the top, stir together melted butter, onion powder, garlic powder, and crushed red pepper and pour evenly over the tops of the rolls. Cover with aluminum let set for 10 minutes, then bake for 10 minutes. Taco meat can be made a day ahead of time. If looking for a way to use leftover taco meat, cut this recipe in half. This post is so timely because I’m having tacos for dinner tonight and my husband would WAY rather have these with the leftover meat than have tacos again! They look delicious! Thanks, Sam! Mine would too, with just the two of us the other half of our taco meat is perfect for 6 rolls! 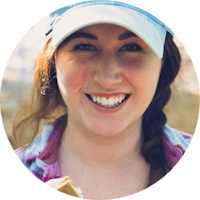 This is a great way to change up Taco Tuesday–so doing this soon! Definitely, I hope you enjoy them! These look awesome. Super excited to try them. We always seem to have leftover taco meat! They’re perfect for making a half batch with when you have leftover taco meat! What a fun idea for a twist on tacos! I am always looking for ways to change up or taco night…which is a staple. Thanks, these are definitely a great way to do just that! Whoa- that melty cheese is putting a spell on me! These look unbelievable! These look deelish. A question though. Do the peppers go on raw ? Hi Vicky, Yes, straight from the jar! My kids and husband loved these! I left out the Jalapenos for the kids. Very easy!